The Renegade Door Stop Attacher is another precision machine to save valuable time, increase efficiency and improve product quality. SA-8 is fitted with a positive air clamping system that will straighten any reasonable bow or warp in both the jamb and the stop. 9 remote firing staple guns can be fired simultaneously by pressure on the button of a centrally located valve. Guns are to be obtained and supplied to Renegade by purchaser. Narrow (1/8″) crown staples are recommended for minimum marring of stops. The Door Stop Attacher is designed and built by the machinery craftsmen at Renegade with a reputation for quality and service. 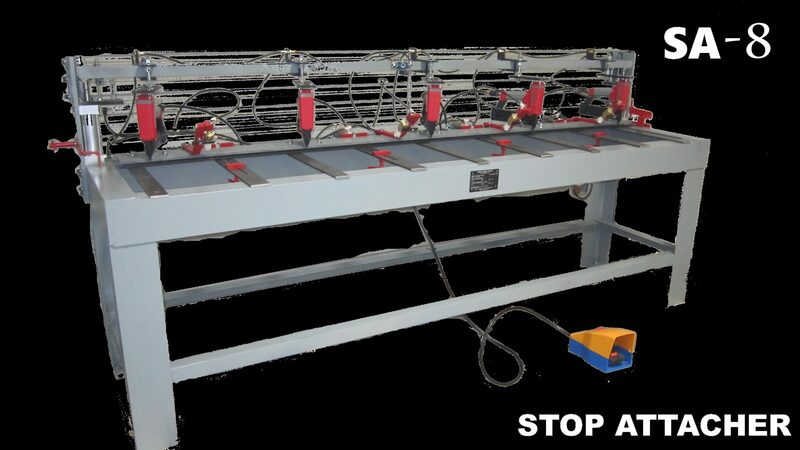 A jamb and a stop is placed against the right or left hand stops at either side of the machine. The operator then clamps the material by depressing the foot operated switch. Clamping action straightens warped material and perfectly aligns the door jamb and the stop. A turn of conveniently located valves then selects between firing three or four guns for headers or all nine guns for jamb legs. With the touch of a button the operator the operator activates the simultaneous firing of the selected guns, securely attaching stop to jamb. The Renegade SA-8 is custom-built to utilize any brand of staple gun the customer selects and supplies. The cost of the guns is not included in the price.